We are so pleased with the attendance at our Annual Members’ Meeting and Holiday Party that was held on Tuesday, January 8. 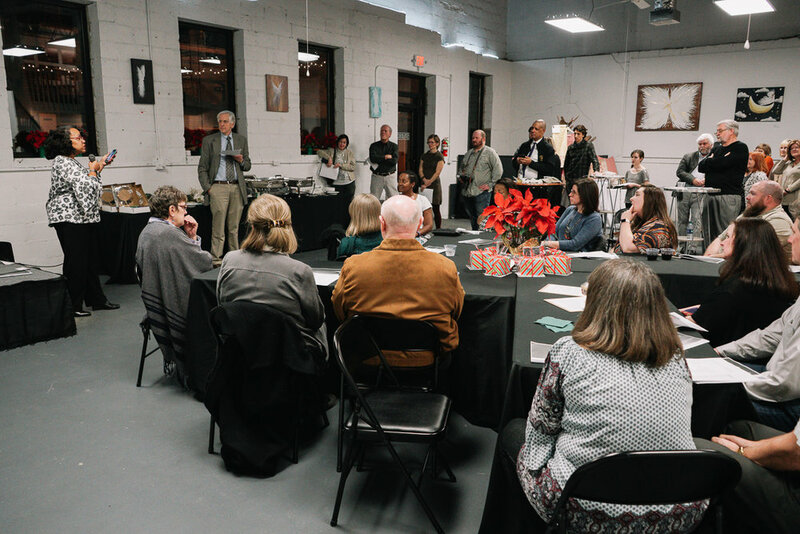 With about 70 members and guests present, we enjoyed the company of our fellow arts supporters in the lovely Ruston Artisans’ Venue. Thanks to Judi Null and Todd Maggio for allowing us to hold our meeting in their event space. The evening’s agenda included business, such as the ratification of our by-law revisions and the election of new board members. We are happy to elect onto our board of directors Mike Leblanc, Carolyn Collier, DeVaria Hudson, Natorshau Davis, and Erika McFarland. We are certain their participation and service will be beneficial to our board, and therefore to our cultural community. Our Treasurer, Tim Everett of Origin Bank, delivered an annual financial report, and I offered a staff report that reflected upon the year and it’s programs, fundraisers and special events. I was also happy to present and thank the interns who helped us in 2018: Michael Miller, Skylar Vickery, Abi Watson, Brittany Alford, Mary Tyler Storms, and Bailee Golden. The talented Katelyn Fajardo was our musical guest, and our delicious dinner was from Ponchatoula’s. We appreciate our members, and enjoy this annual event where together we take a look back at the year and also look forward to the future.